When USA network suddenly cancelled The Dead Zone last year, loyal viewers were understandably upset. After all, the sixth season ended in a cliffhanger. The network further aggravated fans by saying that they had no intention of filming any kind of resolution for the series. 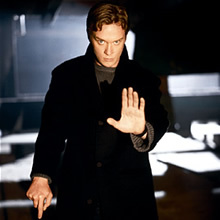 In a recent interview with Sci Fi Wire to promote The Dead Zone: The Final Season on DVD, series star Anthony Michael Hall said that there might be a finale after all. Though the series wasn’t given a proper finale, Hall remains appreciative to everyone involved, including the viewers and the network that cancelled the show. On the Todd and Tyler Radio Empire Show, he said, “I think [the show] ran its course, we had a great run. We did 80 episodes over six seasons and USA network was great, a great company to work for and we had a great run with it. It was a great show, we had a lot of fans of the show, a great writing staff. It was just an amazing experience to do a show like that for six years, it was a lot of fun.” Stay tuned! 10 years later I discovered the Dead Zone. After watching the entire series it would end without an actual ending. I truly hope Dead Zone creators will finish the series. One can hope? It was one of life’s wasted opportunities to not end this show properly. Whilst it struggled to find its way sometimes, it had a feel to it which was different and unique and a genuine story to tell. You felt invested in the characters. Now nothing will likely come of things. But it is remembered fondly. There really needs to be a finale movie to wrap it up. It doesn’t have to be in theaters, it can be a TV movie. If USA is too dumb to do this then please Netflix make it. I completely agree. It is so wrong to leave fans without a real “Finale”! Low ratings? Seriously? Any worse than the rerun junk regularly aired on USA?